The wait is finally over. The next version of SCCM is out. You may heard the name SCCM Vnext or SCCM 2016 but the final name is simply SCCM. This is due to the fact that SCCM is now part of the new SaaS platform which means that its update cycle will be much quicker than before. Each new version will be named as SCCM YYMM (Year Month). The first release is 1511 (for November 2015). SCCM 1511 brings a whole new set of features. Don’t get surprised, the jump isn’t as big as 2003 to 2007 or 2007 to 2012. The console has the same look and concepts are the same. If you’re upgrading from 2012, the upgrade process is similar as applying a service pack. No need to do a side-by-side migration. 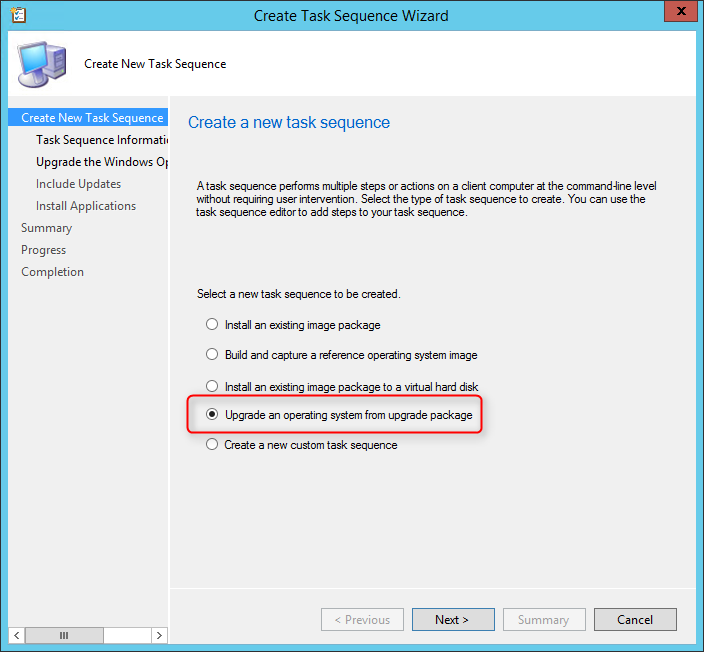 See our SCCM 1511 Upgrade guide if you’re ready to upgrade. If you’re a long time SCCM Administrator, you’ll enjoy the new features. If you’re new to SCCM, welcome to the family! You now have the best management tool available. See our SCCM 1511 Installation guide if you’re ready to install or see our complete blog series if you need help to start from scratch. The list of new features is pretty long, if you’re planning to have Windows 10 computers, this version is a must. It brings all the management tools you need to migrate and manage it. View the state of Windows as a service in your environment, create servicing plans to form deployment rings and ensure that Windows 10 current branch systems are kept up to date when new builds are released, and view alerts when Windows 10 clients are near end of support for their build of Current Branch or Current Branch for Business. Preferred management points is a new option that enables clients to identify and prefer to communicate with management points that are associated with the clients current network location (or boundary). When configured, clients attempt to use a preferred management point from their assigned site before using management points from their assigned site that are not configured as preferred. Ability to manage Office 365 desktop client updates using the Configuration Manager Software Update Management workflow. When Microsoft publishes a new Office 365 desktop client update to Windows Server Updates Services (WSUS), Configuration Manager will be able to synchronize the update to its catalog if the Office 365 update is configured to be part of the catalog synchronization. The Configuration Manager site server will download the Office 365 client updates and distribute the package to Configuration Manager distribution points. The Configuration Manager client will then inform Office 365 desktop clients where to get the updates and when to start the update installation process. At the time of writing these lines, there’s no O365 available in WSUS. Multiple deployments for each Automatic Deployment Rules (ADR) you use to deploy software updates. This can help you manage the complexity of deploying different updates to different collections. After an ADR is created, you can go back and then add additional deployments. Right-click the ADR and select Add Deployment. A new update model that helps keep your Configuration Manager deployment current with the latest updates and features. This model replaces the need to install separate service packs, cumulative updates, or Extensions for Microsoft Intune, to gain new functionality. This service model is similar to those seen with other Microsoft products like Windows 10. When SCCM installs, it automatically configures a new site system role on the site server, the cloud connection point. Is used by the site to check for and download updates to Configuration Manager. Is used for submitting usage and diagnostic data from Configuration Manager. Typically, updates are cumulative so you will not need to install each previous update before installing the most recent update. However, it is possible that some updates will have a prerequisite of a previously available update. With client piloting you can easily deploy and test updates to the Windows client using a pre-production collection while leaving your current client version in use by the remainder of your hierarchy. When you pilot a client update, only the clients that are members of the pre-production collection that you selected install the updated client. At a later time, when you’re ready, you can move the updated client version from pre-production to production, making it available to all your clients. You must use Updates and servicing to install an update that contains a new Configuration Manager client. When you install the update, on the Client Options page you must select the option Test new version in a pre-production collection. 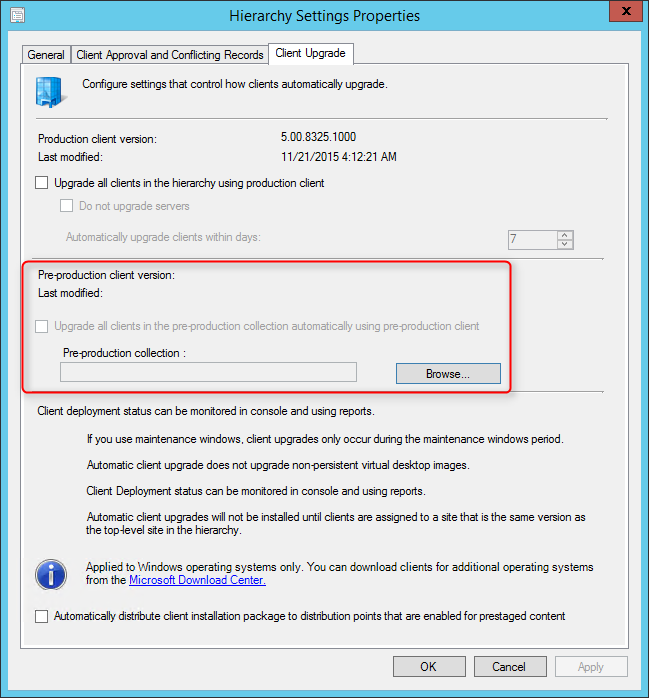 You must configure pre-production client updates for automatic client deployment. The result of doing so is when you choose to test a client update with the pre-production collection, clients in the collection upgrade to the new client version immediately. 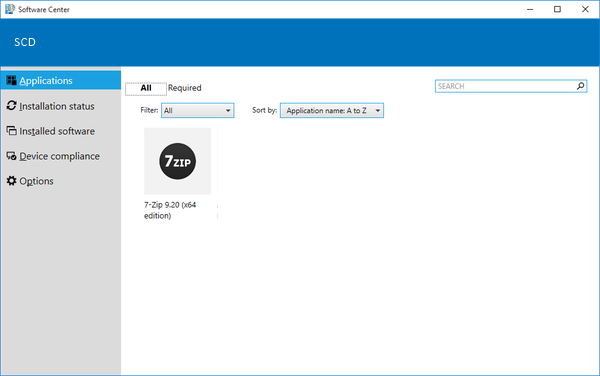 Software Center has a new, modern look and apps that previously only appeared in the Application Catalog (user-available apps) now appear in Software Center under the Applications tab. This makes these deployments more discoverable to users and removes the need for them to use the Application Catalog. Additionally, a Silverlight enabled browser is no longer required. This is a new operating system deployment scenario for upgrading computers that run Windows 7, Windows 8, and Windows 8.1 to run Windows 10. In addition, you can read the complete official list from Technet. Founder of System Center Dudes. Based in Montreal, Canada, Senior Microsoft SCCM Consultant, 5 times Enterprise Mobility MVP. Working in the industry since 1999. His specialization is designing, deploying and configuring SCCM, mass deployment of Windows operating systems, Office 365 and Intunes deployments. Interesting comments – Coincidentally , if anyone is wanting a NZ INZ 1202 , my business filled a blank version here https://goo.gl/wN67Wi. You mention above that 1511 has support for AlwaysOn Highly Available DBs. As far as I’m aware, this is only from TP 4. I know this as I have tried with the ‘standard’ 1511 install and it doesn’t work. Might be worth pointing out. is there a trick to get beautiful icons in the softwarecenter? I use *.ico files with 16, 32, 64, 96, 128 and 256pixel icons in it, but in the softwarecenter he always shows the 16×16 streched to a fuzzy something. I wish Microsoft can add more client management features like Right click tools offers….. Thanks for the post, we just kicked the tires on the new software center but are dumb founded by the SCCM team’s lack of detail. Between the tile text name character limitation and no list view is going to kill our ability to promote the use of it with our users. Yeah, that’s pretty much the first impression I got in various environment. Hopefully the PG will fix this in upcoming versions. Hi. Thank you so much for all your detailed information. Currently I’m on SCCM R2 SP1 and we are not able to upgrade our current Windows 10 PCs to new build through SCCM. We can only deploy regular updates but not builds. Is this new version of SCCM capable of deploying new builds to Windows 10 machines? Hi, I have not been able to find clear information on that so could anyone confirm if the application catalog (web) remains unchanged after the upgrade? We don’t want to enable the new software center experience yet. We basically want software center and the application catalog to remain in SCCM 2012R2 “mode”. I never tested it but it should remains. Does this mean that the feature didn’t actually make it into 1511 after all (and is only in a later Technical Preview? The feature made it to 1511. The thing is that there’s actually no update available (at the time of this writing) for O365. We have an upcoming post on this topic when the first updates will be released. Hi – FYI, cluster patching is not in 1511. You’re right, post updated. Thanks Greg. We have a lot (like in…A LOT) of different software available for our users. The new software center with the big icons make finding a specific program an utter pain in the a** for the user.. We need the list view back. The big Icons are a real Problem. For some systems we offer Windows updates to be just available. All updates are shown as an Icon now and you have to select every Icon individually. Systems which are updated every couple of month will have a list of a bunch of updates. So you need a lot of time to select them in new Software Center. I upgraded the server and the client to the latest version (1511) and 5.00.8325.1000 but idont seethe new software center !!! It is still the old app. Nice coverage of new features! I’ve been keeping current with SCCM but haven’t kept clients up to latest, do you know if I upgrade to 1511 first that SCCM will still be able to manage the following client (until I push 1511 to all)? Yes, all clients will be able to communicate to your 1511 server.